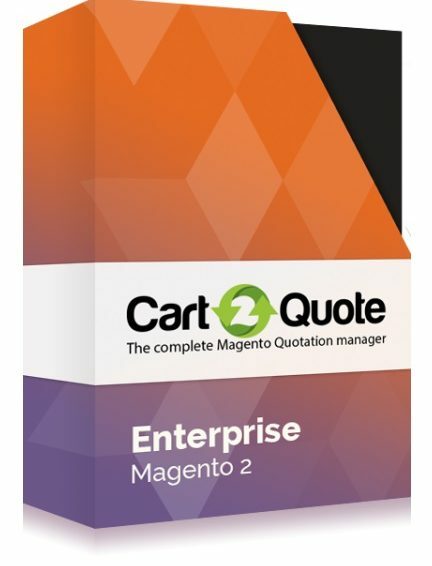 Below, we shed light on one essential business tool – the Cart2Quote Magento 2 extension. It allows you to receive quote requests, as well as edit or submit proposals and turn quotations into orders. For more B2B Magento extensions, check these posts: B2B Magento Modules & B2B Magento 2 Extensions. But now, we will dive deep into the functionality of Cart2Quote. If you are looking for the appropriate Magento 1 version, we recommend you to concentrate on the Magento 2 platform and its modules, since they provide more business opportunities. You want to hide your prices from competitors. 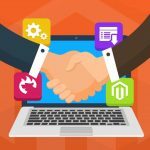 Now, let’s figure out how to submit quote requests via the frontend with the help of the Cart2Quote Magento 2 extension. It is a significant feature because it enables you to share the desired functionality with store visitors who can choose and add products to a “quote cart”. Note that the module provides the ability to convert “quote carts” to ordinary shopping carts and back. Thus, a quotation can be requested everywhere (if you enable this function in the backend). Thus, a customer gets a very intuitive and easy to use tool for submitting quotation requests. Another important aspect of the Cart2Quote extension is the ability to create proposals right via the backend. Thus, everything happens within the Magento 2 environment. When a customer requests a quote, the extension sends a notification to you or your admins. Next, you (or your administrators) can provide an answer to the quotation: specify custom prices, add comments (per product of for a whole request), manage products in the quote request (add or delete), as well as send proposal PDF via email. The next stage is quite simple: a quote should be converted into an order. With the Cart2Quote Magento 2 extension, this process becomes seamless. A customer who created a request receives a notification with your proposal. Then, it is necessary to perform just one click to get access to a customer dashboard which is located on your Magento 2 website. Here, proposals can be converted into orders in real time. If a customer doesn’t want to spend extra time converting his or her quote request, you can do everything via the backend. 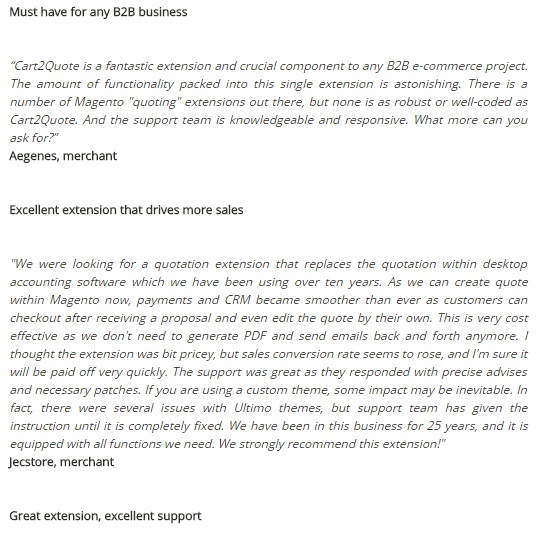 These are the core principles behind the Cart2Quote Magento 2 extension. 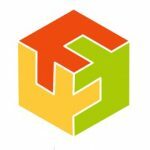 Let’s take a look at some of the module’s reviews before proceeding to the backend and frontend Magento 2 extension tutorials. Action – you can view each quote request from this column. Each quote page is divided into the following sections: Items Quoted, Quote & Account Information, Address Information, and Quote Total. Items Quoted is a section where you can view and edit quoted price and quantity. Besides, it shows a product name and SKU, cost price and original price, discount price (you can enable/disable it here), row total, and GP Margin. From the Action drop-down menu, you can assign a quote to a section or remove it. A subtotal proposal can be applied here as well. Note that it can be either a fixed amount or a percent. The Quote & Account Information section illustrates a quote number and other details like the quote date, status, expiry and reminder dates, websites of purchase, and currency. You can also leave comments here. Besides, you can see the Aсcount Information block in the section. It shows a customer name, email, and group, as well as allows assigning a sales representative. Next, there is the Address Information section that allows you to change to default billing and shipping addresses. In the last section, you can change shipping methods and refresh shipping rates. 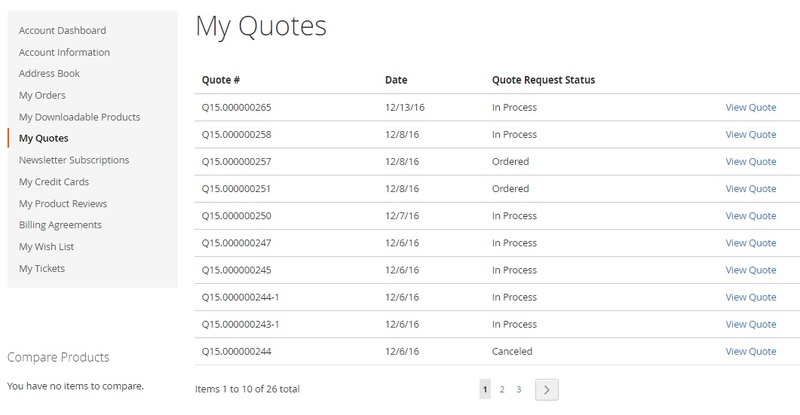 Besides, Quote Totals not only shows original subtotal, quote adjustment, subtotal, shipping & handling, and grand total, it also provides the ability to submit the quote and preview the quote PDF, as well as create an order. 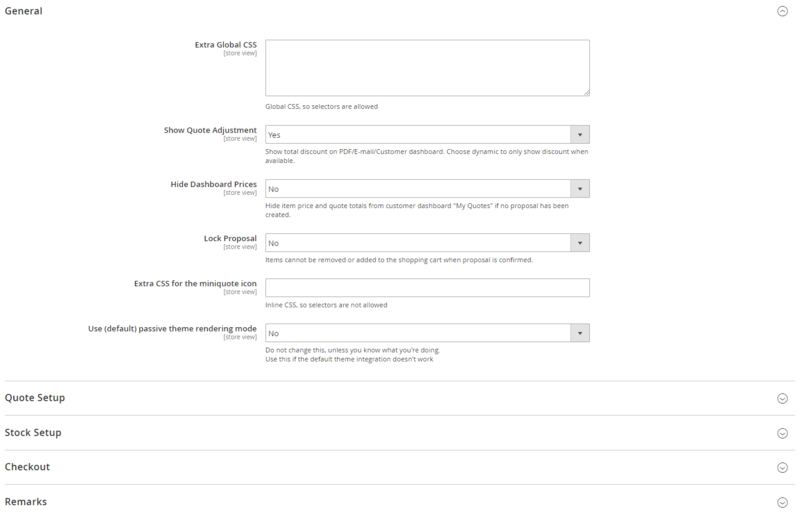 While creating a new quote via the backend, you should select a customer first of all. 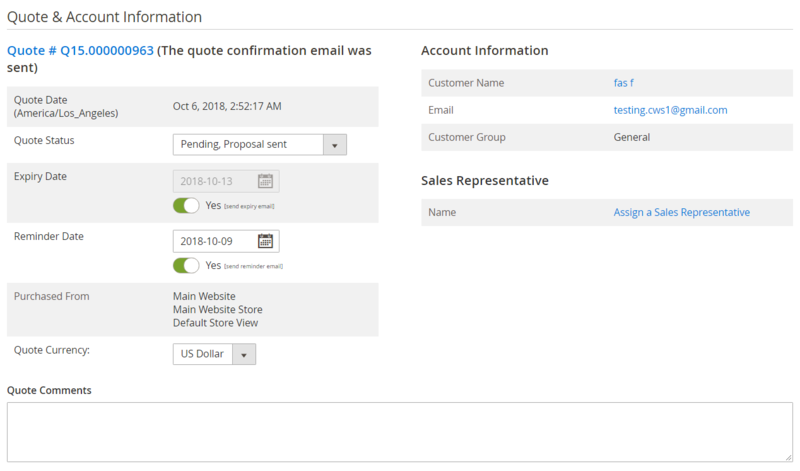 Next, choose the order currency and customer group and specify a customer’s email. In Address Information, specify billing and shipping addresses. You can use the same data for both, as well as save them in the address book. Then, add comments if necessary and click on the “Create Quote” button. 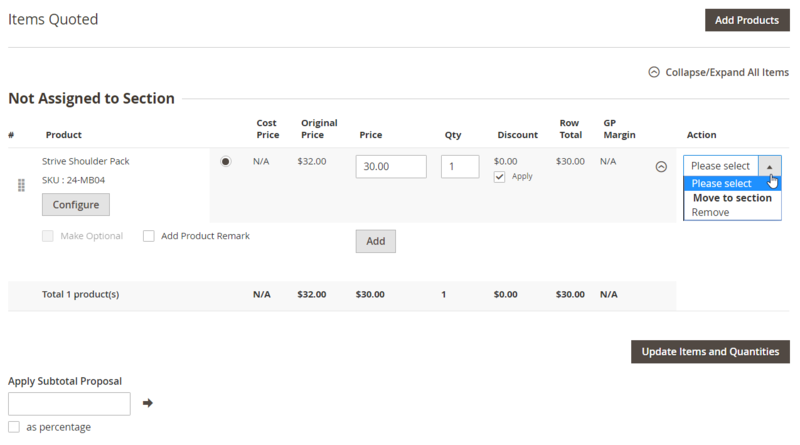 On the quote page, select products to order (Add Products button), and you will open the grid with products. After selecting necessary products, you will be able to adjust their quantity, set a custom price, apply discounts, as well as choose actions from the drop-down (Remove, Move to section). The next steps are similar to the ones described above. 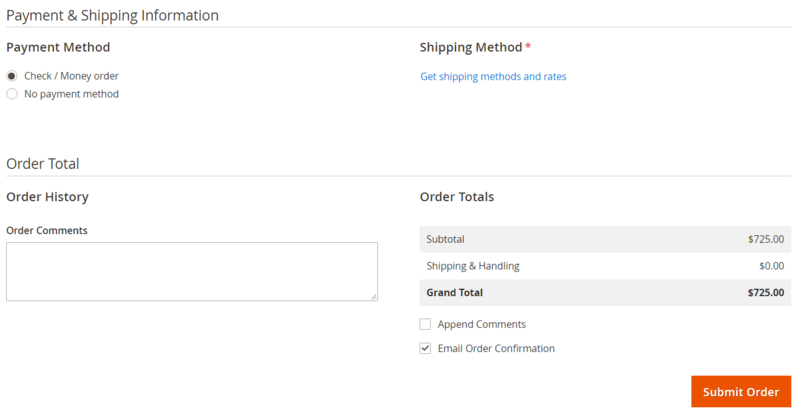 After configuring all options and clicking the “Create Order” button, you will be able to select payment and shipping methods in Payment & Shipping Information. 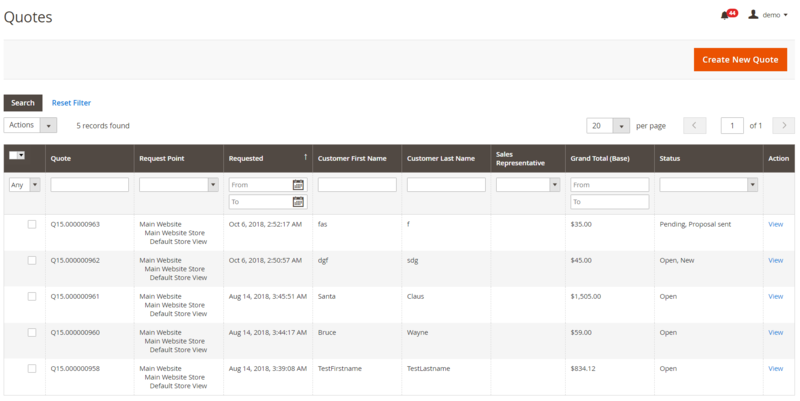 In Order Total, you can add order comments and view order totals. Then, you can submit an order (this option is also available in the sticky menu bar). The extension settings are divided into 5 tabs: Quotation, PDF Print-outs, Quote Email, Advanced, and Form Builder. The Quotation tab is divided into three sections: General, Global, and Proposal. 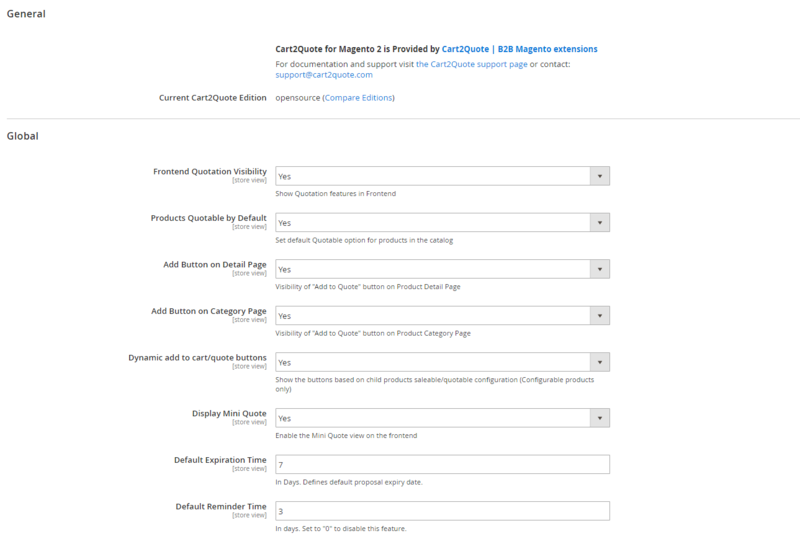 The Global tab allows you to enable/disable the Cart2Quote Magento 2 extension on the frontend, make products quotable by default, add the “Request Quotation” button on detail and category pages. Here, it is also possible to activate dynamic add to cart/quotation buttons and mini quote view, as well as set the default expiration and reminder dates for a quote. In the next section of the Quotation tab, you can enable auto price proposals, set email sending delay, and decide on the proposals strategy. In PDF Print-outs, you select options for the quote PDFs. 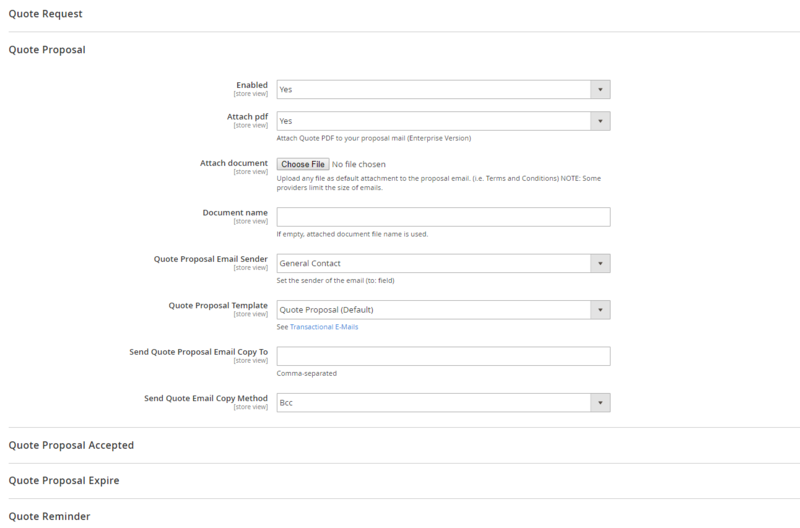 In Quote Emails, you configure emails for quote requests and proposals, accepted quote proposals, expiry notifications, reminders, and notifications for sales reps. The module allows you to select email templates, senders, and additional receivers, as well as attach documents to quote proposal emails. The Advanced tab enables you to customize the appearance of the extension on the frontend via CSS. As for Form Builder, here you can enable/disable quote submission form and allow guest requests, as well as configure the form fields using the drag and drop tool. As for the frontend, Cart2Quote allows you to select several combinations of information available on the catalog and product pages (note that Not2Order should be installed). 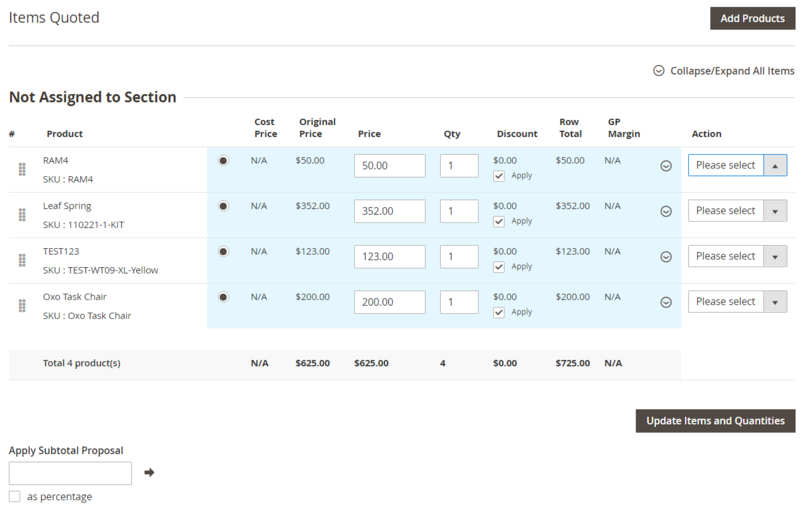 Thus, you can show price as well as both buttons – “Add to Cart” and “Add to Quote”. Any of these elements can be hidden on both catalog and product pages. If a price is not displayed, it will be visible in a cart. To create a quote request, you should hit the appropriate button. 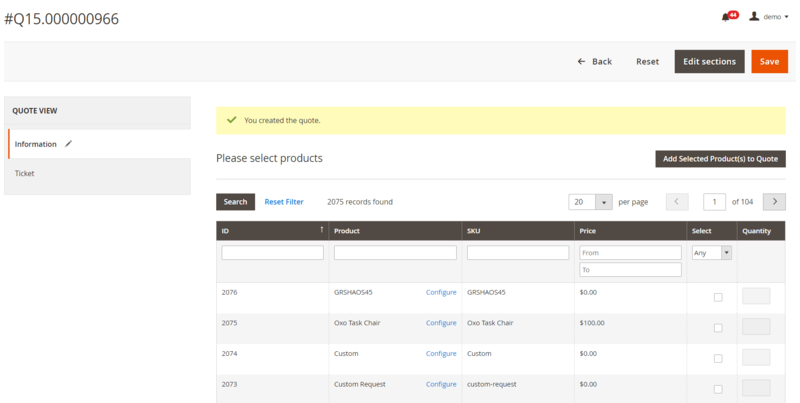 A product will be added to your quote cart, where you can adjust its quantity. Next, you can continue shopping or request the quote. All your quotes can be viewed via a customer account on the My Quotes tab. Below, you can see how an individual quote page is designed. 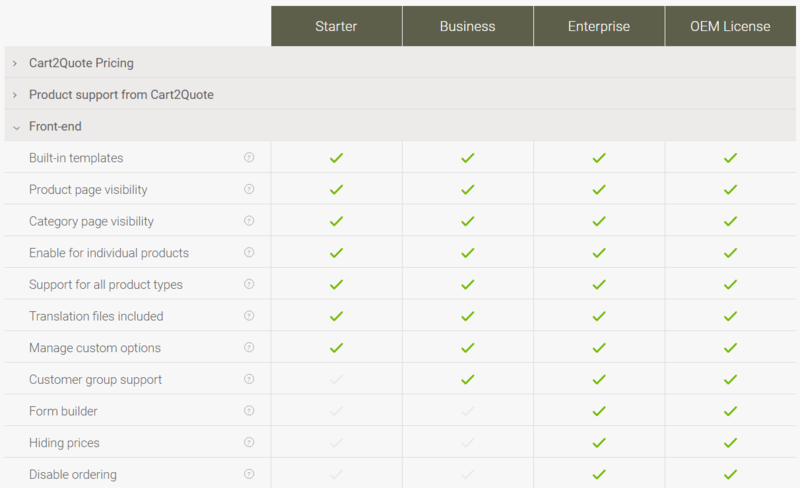 There are 4 editions of the Cart2Quote Magento 2 extension: Starter, Business, Enterprise, and OEM License. Each one has a different set of features and update period. As for prices, you can purchase Starter edition for €599, Business edition for €799, and Enterprise edition for €999. In case of the OEM License edition, ask for price. We recommend you to choose the Enterprise edition since Starter and Business don’t provide the ability to configure quote request submission forms, hide prices, and disable ordering. Besides, they do not support quote versioning and offer a paid CRM ticketing system, while in case of Cart2Quote Enterprise and OEM License you get this feature for free. Note that the Starter plan offers even more limitations.